benf.org : other : cfr : Renaming fields - (For obfuscation or otherwise). Some decompiled code occasionally ends up with the same field name repeated multiple times - i.e. 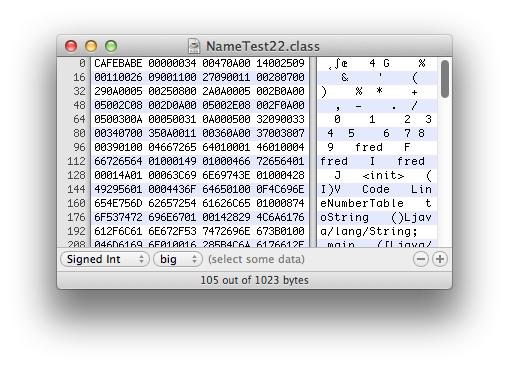 There are many fine class file editors out there, but that's sort of out of scope! The issue here is that these fields now apparently have exactly the same name - that's illegal java! The JVM spec section 5.4.3.2 says the following: If C declares a field with the name and descriptor specified by the field reference, field lookup succeeds. Note - BOTH name and descriptor (type information) are used for the JVM to uniquely identify a field. This means that according to the JVM, it's perfectly legitimate to have two fields of a different type with the same name. It's just an example where the constraints of the java language are slightly tighter than the constraints of the JVM. What about if the types were the same too? Nope. Sad JVM - which is of course entirely consistent with the specification above. So why might someone do this? Maybe a bit much - I think this is about as effective an obfuscation as turning a sign saying 'Top secret base this way' upside down. This one seems much more likely to me! In my example above, I hacked existing symbols so they had the same text. However, it would be equivalent to remove the duplicate symbols from the Const Pool altogether - which (obviously!) saves some space. Not much, but perhaps in the world of Mobile Java, this is still a thing worth having. So how do I read this code? So.... just do that! Because the types of the fields are part of the key, this flag appends _type to any duplicate field. Great! But why not always run with this flag on? Because renaming fields like this will break any code which relies on reflection to access fields - i.e. it will change the semantics of code which USES this. Because another class which USES this class, when being decompiled in the absence of this class, can't know if this is an issue.